Call 1-800-634-5557 to Purchase or Rent! Effortless Loading with unique traction design – Contractor’s choice! Withstands up to 60,000 lbs. Due to their size and weight, TRAKMAT® cannot be shipped by UPS Ground service. You may pick them up at our shop in Conway, MA (please call ahead to ensure that we have the size and quantity that you are looking for), or they can be shipped truck freight or delivered on one of our trucks (New York / New England region only). 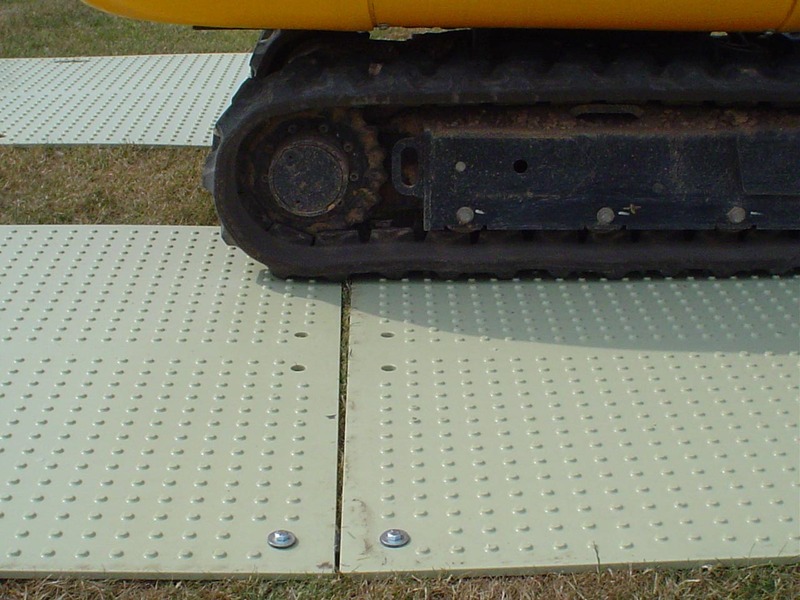 TRAKMAT® is manufactured in a range of convenient sizes to fit the job. We recommend that you choose a mat that is 1/3 wider than the widest tire that will be driven on the mat. Note that TRAKMAT® comes in two colors “Cool Green” or Black. The “Cool Green” color is recommended to prevent heating up and burning out grass. The Black is recommended for applications where heat build-up is not a concern. See The Temperature Guide to help determine your color choice. Also note that there is a quantity discount on mats. Item Size 1 - 9, ea. 10 - 49, ea. 50+ ea.